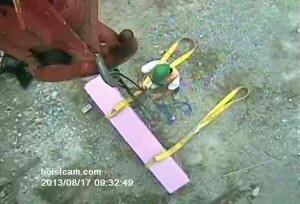 The HoistCam (http://www.hoistcam.com) from Netarus can also be used on mobile cranes such as truck cranes, telescopic boom cranes, and crawler cranes to place the eyes of operator anywhere on the job site that he needs to be able to see. Eliminate blind spots, increase productivity and, most importantly, increase safety for the site, equipment and the people around the crane with HoistCam cameras on cranes. HoistCam Repeater allows the standard HoistCam to be used with telescopic boom cranes without the need for an antenna. Available in battery, 12VDC and 24VDC versions, the HoistCam repeater eliminates all blind lifts while maintaining wireless communications during the entire lift. Learn more about using the HoistCam repeater for telescopic boom cranes. HoistCam boom tip camera allows the operator to quickly attached and view the load from the boom tip. Since the camera is install in under 5 minutes, no welding is required. The camera and optional battery pack are attached to the boom tip in seconds with a monitor conveniently located in the operator’s cab. Learn more about the HoistCam boom tip camera for mobile cranes.